I remember not too long ago hearing that the video game industry had passed the movie industry in worldwide sales. I found that very interesting. 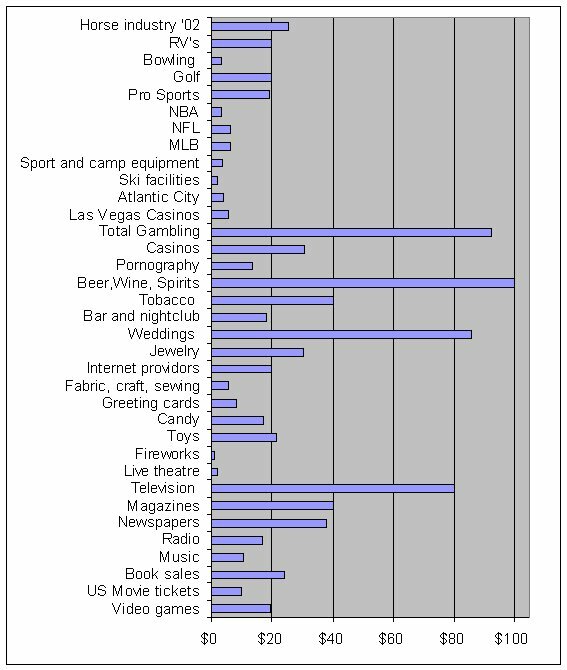 I thought it would be interesting to find out how much is spent in the various forms of entertainment in the USA. Theres big money in this stuff. Entertainment is a huge industry in the USA and worldwide. According to PriceWaterhouseCoopers the worldwide spending on Entertainment and Media is expected to hit $2 trillion by 2011. In the USA the spending on E&M is expected to hit $754 Billion. Below are a list of various industries and the amount spent in each for the U.S.A. The figures are in Billions of dollars. The figures are from various sources that I found via Google searches. The number for live theatre was from 1992 which is the only one I could find. There is some overlap between categories, like for example the spending in bars and nightclubs would overlap with spending on beer, wine & spirits. And the spending on MLB would be part of the spending in pro. sports. I didn't check the accuracy of the figures so I can't say if every one of the numbers is correct. Personally I doubt we spend $25B a year on horses, but what do I know.